Last month, while out enjoying dinner with a group of like-minded parents from my children's school, the conversation turned to our kids' safety. Comments included, "We have a six-foot privacy fence, but I take my laptop outside whenever the kids are playing in the yard because you just never know," and "I used to walk the dog around the block when I was a kid, but nowadays I don't even let my kids walk ours down the driveway." I kept quiet, as did the mom across from me, but she caught my eye, then shrugged her shoulders semi-apologetically and said, "I let my son play outside by himself all the time." I smiled, relieved not to be the only one, and said "Me too," adding, "I mean, I can see them through the windows if I need to." We smiled at each other, and I felt a little embarrassed, although I wasn't sure why. Then, from the far end of the table I heard one mom's woeful remark, "It's just so dangerous now, not like when we were young." Kim Brooks's book, Small Animals: Parenthood in the Age of Fear, shares extensive research proving the opposite of what these parents believe to be true. In fact, the author points out that incidents of child abduction have decreased significantly in the last twenty years and suggests that if we'd all just relax a little, we'd worry a lot less. But the book demonstrates that that isn't so easy to do. Brooks first wrote about parenting in fearful times in her June 4, 2014 Salon essay titled "The day I left my son in the car." That day, Brooks, a self-proclaimed "uncritical consumer of anxiety," was forced to look at American parenting culture through a whole new lens when she was arrested for leaving her four-year-old son alone in a locked car. What happened to her in the parking lot of a Virginia Target store inspired Brooks's research into the modern culture of fear. 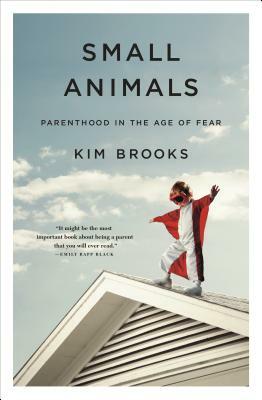 One of the most intriguing sections of Small Animals examines the history of parents' fear in America, much of which Brooks claims is imagined. She explains how we've inflated and perpetuated certain "danger" myths throughout time and hypothesizes that fear is a powerful tool the mind uses to divert parents' attention. In order to cope with dangers we can't control, we've historically exaggerated the danger of what we can control. What the mind perceives or imagines to be, therefore is. As one example, Brooks looks at Puritan culture, examining why parents focused their child-rearing efforts on behavior modification by creating strict rules and extreme punishments designed to reduce sinfulness in order to guarantee spiritual redemption. These same parents almost entirely ignored disease prevention, even though nearly 30 percent of children died before reaching their twenty-first birthdays. Puritan parents focused their disciplinary efforts on behaviors that they believed they could change through conditioning, whereas the very real danger of death by smallpox or diphtheria were completely out of their control in the days before germ theory. With each of these parental fixations, the object of fear correlates less to the level of risk than to parents' ability (or perceived ability) to exert control over the outcome. If you are a Puritan parent, why fret over the very significant possibility that your children will perish by contagion when you lack any knowledge or medicine to manage this risk? Better to worry about moral corruption and spiritual goodness, outcomes one might hope to influence.… Likewise, today's parents and parenting experts tend not to focus on many of the very daunting problems facing our children when those problems are beyond the scope of an individual's influence. In the chapters that follow, Brooks expounds on the gap between perception and reality. She cites statistics from expert agencies like the United States Centers for Disease Control to show that very real risks to American children from diseases like Type 2 Diabetes or heart disease are not being adequately managed. Parents ignore dietary and activity guidelines for children that are proven to reduce risks of these diseases later in life, yet go to extreme measures to ensure their children are never at risk from abduction by teaching stranger danger before children are even able to talk. In actuality, Brooks argues, the number of cases of kidnapping that parents fear most—the kind depicted in television crime dramas where a family is enjoying a sunny day at the beach when a child is lured away by a stranger with an ice cream cone—make up only 0.1 percent of missing persons cases. In contrast, nearly 20 percent of children in the United States are overweight or obese, conditions which can lead to disease and early death. Small Animals wasn't written to relay our history, however. It wasn't written to cite statistics. It was written to answer questions. It was written to understand why parents focus on perceived risks instead of real ones. It was written to try to understand what we are so afraid of. Mostly, it was written to answer the very personal question of why someone would call the police on Brooks when she left her son alone in the car for five minutes. This book is as much a story of one woman's quest to understand what happened to her as it is to understand what has happened to all of us. As I sat around that dinner table last month, a bit afraid to enter the conversation where I had the potential to be the odd-mom-out, I wondered what everyone there would do if they saw a child alone in a parked car. Would they assume the child had been abandoned and call the police, or would they wait to see if the parent returned quickly, as Kim Brooks had? Would they let fear take over and assume the worst? Or would they assume the best of the parent and take a moment to take care, to wait by the car and assume the parent had made only a "temporary lapse in judgment" and would return soon? These are the questions Small Animals will leave you asking, not just of others, but of yourself as well. Kathleen Buckley is a writer and designer living outside Chicago with her husband and two sons. Her work has appeared in The Rumpus, Paper Darts, and Superstition Review, and her stories have been selected for inclusion in the Chicago Listen to Your Mother and Expressing Motherhood Shows. She holds an MFA in Creative Writing from Roosevelt University, is Reviews Editor for Literary Mama, and is working on a collection of essays about (dis)belief, motherhood, and the troublesome intersection of the two.